BSE also provides turnkey project installations including the design of systems and networks, coverage predictions, supply of system equipment, including satellite, program feed, antenna systems, Program Input Equipment standby electrical equipment and remote monitoring equipment. BSE provides Broadcast System Design, Project Management and Maintenance Support to world markets. We design the requirements for a suppliers various equipment for transmitters sites. Options include addition of UHF front end for receiving UHF STL signal and FM receiver. Options include a multi-channel FM rebroadcast system for road tunnel. Includes Audio Monitor Amplifier to MPX Distribution Controller - 3 Way. This product offers a complete link system for stereo audio or MPX programs. BSE offers a range of feeder cables and accessories to suite our clients needs. Turning your broadcast needs into solutions! Broadcast Solutions Electronics (Pty) Ltd manufactures a range of FM Transmitters from 1W to 5kW. BSE designs and manufactures a range of Solid-State FM Transmitters from 25W to 5kW. 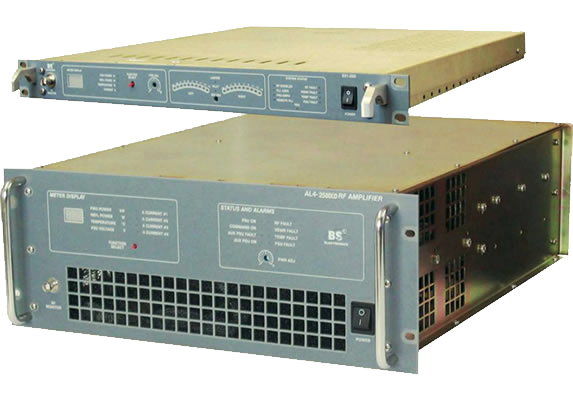 BSE Manufactures a range of FM Digital Translators for LARCAN in the USA.